Once again it is time to celebrate International Talk Like A Pirate Day today Friday September 19th. 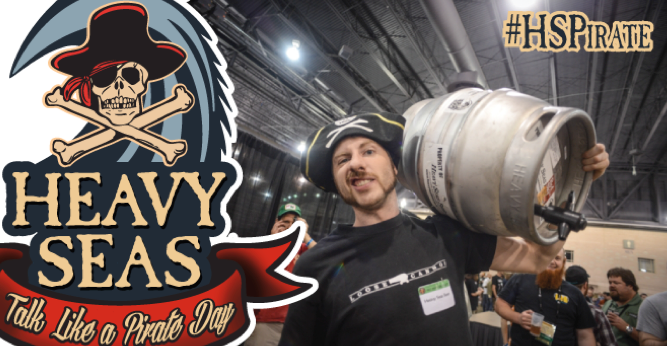 Of course, Heavy Seas is up in the mix but this year they have raised the stakes by attempting to set the record for the largest simultaneous cask tapping in the Guinness Book of World Records. Making its first debut outside of Heavy Seas’ taproom, the firkin to be tapped at several locations up and down the East Coast will be Loose Cannon IPA with grapefruit zest. The Richmond area boasts two locations on the list: Hurley’s Tavern and Southern Railway Taphouse. Beyond the firkin tappings, you can expect many give-a-ways for including t-shirts, eye patches, stickers, temporary tattoos, and a backdrop for pictures. Southern Railway will also have a live pirate show. Head over to the Virginia ITLAPD Facebook event for more information and updates. The parties start at 5pm with cask tappings at 6pm.